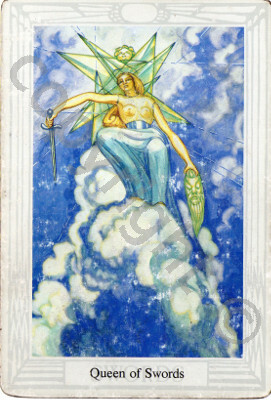 This months card for you all is the Queen of Swords, a card I have a great fondness for. She is a woman who can stand back from the situation – her naked top shows she is open and her heart connection with others is unhindered and at the same time she is able to stand back emotionally from any situation and use her sword of discernment to see whether the situation is for her higher good. She makes an excellent counsellor – someone who you can go to with your troubles assured that she will not get over involved or attached to whatever decision to decide to make and will support you throughout your journey on the path ahead. She is depicted as in the clouds and higher giving her a higher perspective too which also helps her give good advice and support as well as understand the bigger picture. She has removed her own masks yet still has the ability to use them when needed. She can relate to others need for privacy and masks to. Her favourite mask is one of silence and withheld behaviour – helping her stay detached – at times overly so. but in the main she is someone to trust. The clouds are of air and she is rational in her approach though knows her heart she will not act upon it without a rational knowing alongside. It can be that at times she rationalises her emotions too much and keeps the talking and thinking about it going without grounding this with action or actual feeling the situation she is involved with. As with all court cards these qualities can be seen as part of the persons development who the reading is for, their need to take this position or their need to let go of it. As well as representing someone in the life of the querant who is important in the situation for some reason. Often both can be true and applicable as we often attract people to us who mirror elements of ourselves we are needing to study further to either increase their action on our life – bringing the counsellor out in us for instance, or that we need to let go of, the actual person in life perhaps bringing conflict to show the inner conflict when an extreme use of the Queen of Swords is not helpful in life and that more balance is needed. As the tarot reflects our position in life so to those around us, and we can do a reading for ourselves by looking at who are attracting at any one time to see what elements of ourselves we are working with. Bringing more love to those parts of ourselves we dislike and also balancing those parts we over do. What does she say to you now? Are you in need of a listening, impartial ear to help you right now? Do you sometimes withdraw and intellectualise to avoid feeling your feelings?